Warm Up with Some Comfort Food! Home / Warm Up with Some Comfort Food! We are finally seeing some Winter temperatures here in Southern California, and that always has me craving comfort food and a cozy night relaxing at home! This time of year, it’s tough to navigate “comfort” food with health, but it is possible. With recipes like this Roasted Tomato Soup, you can satisfy that craving without sacrificing healthy choices. Enjoy! Preheat oven to 425 degrees. Place tomatoes on a rimmed baking sheet lined with parchment paper and toss with melted coconut oil then season with salt and pepper (place tomatoes halves cut side upright). Place onion slices and garlic on a rimmed half sheet lined with parchment paper and sprinkle with salt and pepper. Place baking sheet with tomatoes and half sheet with onions in oven side by side and roast onions 30 – 35 minutes until edges are golden, and tomatoes 40 – 45 minutes until roasted. Pick out any burnt layers of onions if there are any. Then pull peels from tomatoes. Put onions and tomatoes into a large pot. Add 3 cups vegetable broth and the herbs. Season with salt and pepper to taste. Bring to a boil then reduce heat and simmer 15 minutes, adding any optional ingredients as desired. Blend soup with an immersion blender or in small batches in a blender. Top with Parmesan. Notes: Serve warm with a side of grilled cheese. 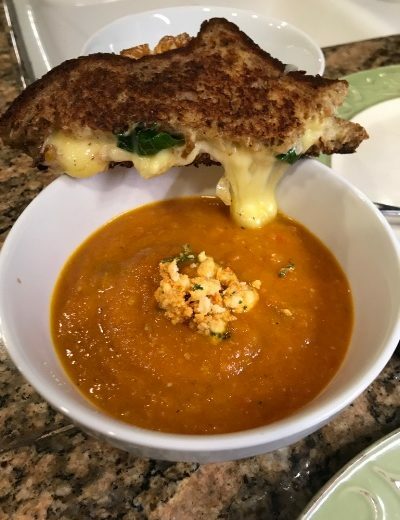 This soup goes so well with gluten free or sprouted grain bread: take two slices of bread, spread with honey mustard, 2 fresh basil leaves and cooked turkey bacon if desired, then layer pepper jack cheese, and provolone cheese. In a pan, add 1 TBSP grass-fed butter and grill both sides until golden brown. Sonia Marie is a holistic nutrition coach & chef. Sonia Marie incorporates the concept of bio-individuality. Each person has unique food and lifestyle needs. One person’s food is another person’s poison, and that’s why fad diets tend to fail in the long run.